Carl Sagan one of the world's leading astronomers provides a new awareness for humans with photographs of planet Earth taken from a super distance by spacecraft Voyager 1. 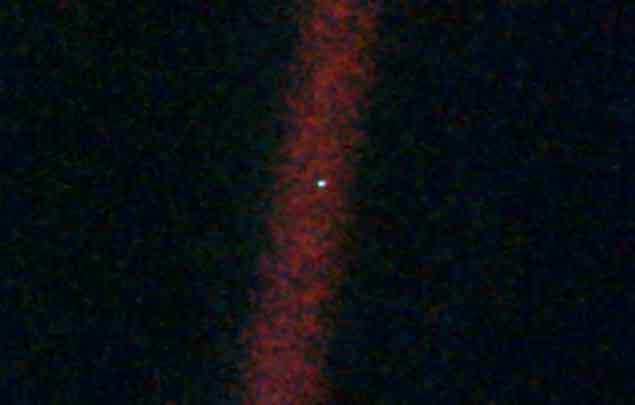 Before leaving the solar system Voyager 1 steers his camera back to earth and takes the photo at a distance of 6 billion miles from earth in 1990. The photo depicts an almost invisible earth, less than 1 pixel only. Carl Sagan calls it a pale blue dot, through the photo he pours a very touching reflection and awakens the human being to its existence. From a distance so far, Earth no longer seems to matter. But for us, it's another story. Look at that point again. That point is called 'here.' That's the house. That's us. At one point it was everyone you loved, everyone you know, everyone you've ever heard of, every human being who ever lived, spent their lives. All our happiness and suffering, thousands of true religion, thought, and economic doctrine, every hunter and encroacher, every hero and coward, every builder and destroyer of civilization, every king and farmer, every young couple in love, every mother and father , aspiring children, inventors and explorers, every good teacher, every rotten politician, every "idol star", every "great leader", every saint and sinner throughout the history of the human species lives there, upon a speck of dust floating in a beam of light. Earth is a very small stage in the middle of the cosmic arena. Think of the river of blood shed by the generals and king so that in that glory and glory they can become temporary rulers at a fraction of that point. Think about the endless cruelty of people at one point of this point against unknown people in another corner, how often they misunderstand how prepared they are to kill each other, how turbulent their hatred is. Our attitude, our fictitious privileges, the delusion that we have an important place in the universe, does not mean anything in the face of this dim glare. Our planet is just a lonely dust in the great and dark realms. In our confusion, amid the vastness of the universe, there is no sign that help will come from elsewhere to save us from ourselves. Earth is the only world, so far, known to have life. There is no other place, at least until some time to come, which can be a place to live. There is something we can visit, but nothing we can live. Like it or not, for now, Earth is the only place we live. It is often said that astronomy is an experience that fosters humility and builds personality. Perhaps no one can show the curse of human pride better than the image of our little world. To me, this picture reinforces our responsibility to do better with each other, and to guard and care for the pale blue dot, the only house we know all along. How touching these reflections, just like the current condition of the earth that is full of evil, war, and hatred of one another. Hopefully, this reflection can add our love to earth and fellow humans to keep the pale blue dot.